Someone seemed enthusiastic to meet other people. Lilja leaned on her hand with her left cheek and stared at the people. Most she didn't know or weren't familiar but that happened when you had amnesia and it sure wasn't a lot of fun when she was but a simple waitress, she would have to work to actual be here. Boring, she sighed upwards to blow a piece of her bangs out of her face and stare a lot more. As the music started, people stepped aside or went to sit down and she still stared at the groom, she ignored Odin on purpose as she couldn't simply start yelling at him but the groom looked familiar but she would recognize him for something but it might be that she had just seen him in the streets or something. Than there was Esperia, with her whole group of friends and she ignored the feeling of being lonely, which was a tough call on a wedding. Lilja wondered if she could try to find someone and sneak him or her into the wedding but there was only one person crossing her mind and that would be a bad idea for going smooth. So she shook her head slightly and turned to look at the other end of the path, the other side of the altar where the bride appeared. 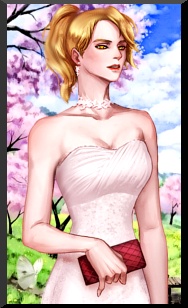 She should probably be beautiful but Lilja just found her a pale complexion in that white dress and again she realized that weddings weren't her thing. Far too complicated and boring, dull and useless. But free drinks and food so that was a good thing. The description about the bride passed to her by her best friend was a rather peculiar, yet interesting one. At first she thought she was crazy due to other reasons, though when it was due to the fact the woman still worked while pregnant only brought a smile to her face. It was good to know that she was going to be attending the wedding of such a nice and honored person. Surely her soon-to-be husband was the same. Liana mumbled to herself, attempting her hardest to memorize the name. It wasn't a difficult one, at least, though she already knew one person with a similar name in the form of 'Alisa'. There was no way she'd do the mistake of confusing them though, the elf wasn't exactly that clumsy. More and more people walked in through the tent, the main event appearing to be about to start. From afar she noticed a wild purple-haired girl approaching, one who seemingly appeared to be rather happy to see them. But who was she exactly? Even with how much time she has spent with her teacher, she still has no idea the Vollan's companion is now able to turn into a humanoid form of sorts. "Who? Lumy?" She struggled to think of who else would have that kind of name. Or nickname, in this case. In the end, and luckily before she received the hug, she remembered. "O-Oh, Lumen...!" The blonde mumbled loudly to herself, preventing making much noise herself before ultimately spreading her arms out and wide, and closing them in around the female. Once she pulled away, she studied the girl up and down, giggling once and smiling widely as she nodded and crossed her arms over her chest. "I wonder why Ali didn't tell me about any of this. Nonetheless, you look stunning, Lumen." She compliments, eventually realizing that her teacher's companion still couldn't speak. In the end, all the girls moved to take their seats, that emerald gaze of hers catching the sight of Alisa once more, a gentle smile and a nod offered in the older woman's direction in case she was noticed. And then, finally, the bride walks in and everyone stares. Her eyes shone in a glimmering way. For Liana has never attended a wedding before and was very, very eager to witness it until its end. Arisa sat down as her body leaned forward. Her left elbow rested against the table while her head tilted to rest her cheek against the palm of her hand. Her golden eyes gazed at all the people that arrived, including the ones she knew. Some of them she didn't know seemed interesting, but they gazed at Lucifer wrongly which to the holy ones amusement, made her feel disgusted. Who were they to judge a person they know nothing of? Her eyes cornered coldly towards Lucifer, ''Do people always look at you with such deranging stares?'' she spoke as cold as her gaze. Her eyes calmly gazed back at all the people who were walking about and wondered to herself out loud. ''I swore my love was suppose to join us...'' she started and frowned disappointed in him. She reminded him everyday of this day because weddings were sacred to her and the holy one. 'His punishment will be no love making for weeks at this rate.' she thought and clenched onto the glass tightly enough to where it breaks. Her eyes went wide as the glass made a cut on her right hand. ''Oh...'' she said suddenly and softly. Her eyes wandered to see some napkins to clench them into her hand so the blood couldn't drip onto her dress nor make a mess of the table cloth. With the empty broken glass on the floor, her fingers tapped onto the table with an impatient stare. She was spacing off while waiting for her lover or someone else to stop by. She saw no point in talking to random people. Arisa didn't think there was... If she was important enough to talk to then they shall start the conversation. Was it because she was nervous? The tall beauty glared at anyone who was gazing at Lucifer with judging eyes till further notice of either the wedding starting or Noel appeared to sit by her. Much to his annoyance, Aleksandr was a little late to the wedding. The shopping had taken him some time. It was like he was a woman. For the clothes, he had decided on a White Tuxedo, with a white shirt under it, and black pants below, with a bow tie to compliment it all. He had chosen black shoes to grace his feet, not out of choice, but rather because the worker at the shop he had gone to said that it would suit him well. Guess he would find out if they suited him or not. He had arrived on the scene around the time that Alice had started to make her way to the altar, and he wasn't very proud of that. But it was what it was, and there was nothing he could do about it now. He couldn't recognize any of the guests here at the wedding, so he guessed he hadn't seen them ever in his life before. Even if he had, he had no idea about it. He regretted that a little bit, knowing no one there, but he could get over it. What he was here for was his brother's wedding, his big day, and nothing else mattered that much. He surveyed the crowd and spotted a...skull? He couldn't put his finger on what the creature or person was, but he didn't give it much thought. He made his way over to the bar but didn't just order a drink. He just stood there and watched Alice and Kon, the lucky couple. He thought he knew the other woman beside him at the bar, but he wasn't so sure about it. He didn't ask if he knew her and didn't say anything at all. He just quietly watched, marvelling at this ritual. It had been a while since he had gone to any wedding at all, much less a family wedding. So he did what he did best at social occasions - be quiet. Quite ironic. Feel free to skip me if I haven't replied in under 24 hours. Chelvaric was standing at the party looking around to the crowd that had gathered. There was a lot of people who had arrived in the neatest outfits they could find. It seemed to be a very popular wedding as it was nearly the same allure as a popstars wedding. He wondered if the bride was nervous getting ready for her big day and convinced himself that she probably was. It was the most important day of their lives after all and some girls could really turn in divas about their wedding. But he was sure that Alice wouldn’t be like that and that everything would be fine. He suddenly heard a familiar voice behind him and turned around to see who was there. His eyes suddenly fell on Snow and it was like someone punched him in the stomach making him breathless. Her beautiful white hair was braided so nicely, while she was adorned by a black dress that was complimenting every shape of her body like little angels saying it into his ears. One of her legs was sticking out through a split in her dress to give a nice accent and showing her beautiful soft skin that adorned her leg. “You look gorgeous babe be careful or the bride will be jealous that you look so good, yes I just made it in time it seems.”, he said while he winked at his little joke. He lightened up with a smile when she said that he looked good. “Thank you babe”, he said and felt proud that his girlfriend liked his outfit. He never knew if te clothes he picked were good or not since he wasn’t a fashion person. He looked around and saw Kon placing a cross into the ground. He wondered if that was the symbol of his religion. “A lot of people have showed up it seems Alice and Kon are quite popular”, he said to Snow and then noticed that people were starting to sit down. It was nearly starting and they better found a seat as well. He liked how Snow had grabbed his arm gently and loved her gentle touch on his arm. “Let's find a seat shall we”, he said to her and slowly walked to some chairs near the front of the audience. He wanted to be sure that he could see everything from a nice location. When everyone finally sat down music started to play and it seemed it was time for the ceremony to begin. When Akira nodded, confirming that it was indeed the groom, Haru was tempted to go meet the man and congratulate him on the occasion. However, seeing how swamped he was with many guests, the healer chose otherwise. Besides, like his partner mentioned, Alice could be walking down the aisle anytime now. He did not wish to miss that while caught amidst the crowd. So, he chose the seats at one of the inner edges of the rows on the bride’s side. More guests filed in one after another and the seats filled up very soon. Now that he had settled in, Haru looked around more keenly for any familiar face. This time, he didn’t miss Fia, especially since she waved at them when he looked in her direction. The scarlet-haired Knight waved back gleefully; the healer had quite the respect for the titan magic user and hoped they found a way to remain in touch even after her exit from the faction. There were two other ladies along with Fia; while he recognized the elf vaguely after much pondering on where he saw her before, this was the first time he was seeing the other lady. Seeing how close she was with Fia, he could only assume they were a couple. This seeded the idea of him holding Aki’s hand and that brought a tinge of red to his cheeks. Hoping to hide it from his raven-haired partner, he looked away, acting as though he was most curious about what was happening at the altar. That was when he noticed Kon place the huge cross behind the priest; finally the mystery as to what he was lugging around was solved for Haru. The healer, unaware of the true nature of the object, assumed it to be a religious relic that was brought in just for the occasion. “Must be a strong believer,” he whispered, turning towards Akira and then pointing sneakily towards the cross. As much as he tried to conceal the fact that he didn’t care much for Illumin, the accusatory tone in his voice was much obvious. At least, it was just Akira he was talking to and she wouldn’t judge him for it… Maybe? The crowd suddenly simmered down and Haru immediately knew why. He swiftly turned his head around to see his angelic mentor walk down the aisle in a beautiful white wedding gown. He watched with a wide grin as she gracefully approached the altar, where her beloved stood awaiting her. This was the first time Haru was attending a wedding; so, he did not find it off that she did not have her father beside her. He assumed this was how it was done. 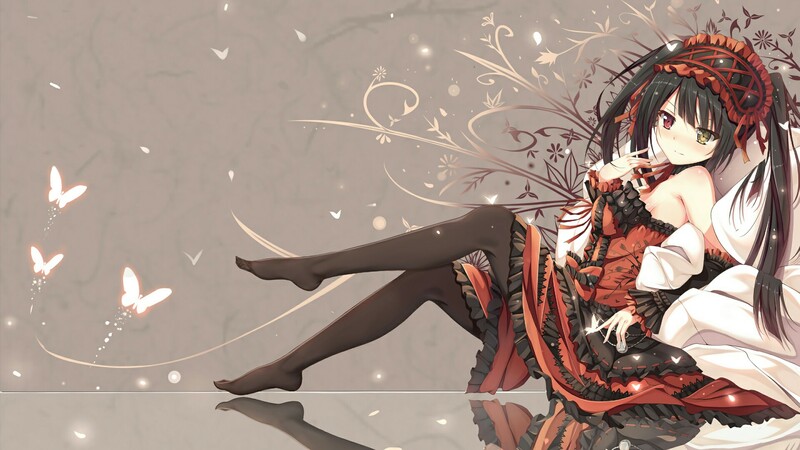 While the people still bustled, to find their seats and pick their drinks in anticipation of the bride to make her way down the make-shift aisle and to the alter, Aki sighed softly and took a moment to tune out all the soft commotion and focus instead on the harmonious sounds of the wild. The overgrowth that acted as a natural frame to this photograph of perfection. The Shimada closed her eyes and let herself sway gently almost as though her stance was under the influence of the breeze. Finally, when she opened her eyes again, she could truly appreciate how calm it was. There was this joyful harmony, despite the diversity of the mages and warriors present here, if only this could stretch on for eternity, the bitter reality was, that it wouldn't. She shuffled along after Tsuru as the two had briefly stolen the attention of the titan woman, Aki returned a gentle smile, and cordially waved back. Even standing on her tip-toes though, she didn't earn more than a fleeting glimpse of the only unknown in that crowd. With a sigh, she gave up and plonked herself beside the healer, they'd have a pretty decent view of the bride as she'd take those fateful steps down the aisle. When Tsuru drew attention to the cross that he'd spotted too, Aki simply shrugged. 'I think so, I ran into him at the Grand Cathedral in Crocus and I think he said the cross was a gift from them... He had it with him then too...' she whispered back earnestly. She shared his skepticism, but she looked around warily, and gently patted his side to stop him from broaching the subject any further. It was entirely possible that there were others here who shared that religious... inclination. Her gaze returned to the few faces she did recognize. It wasn't like she hoped or intended to join them, she was hardly the sort who'd venture into a crowd and try make small talk without any solid reason. However, the existence of people who knew her was enough to glean some comfort. She noticed Lumen had joined that little party, so she idly searched for Alisa's face again as she fiddled with the silken red fiber of her dress. 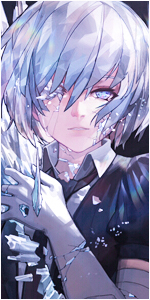 Upon noticing the graceful crystal mage slide out of the tent and towards her designated seat, Aki tensed up, mostly in a sort of a childish excitement. 'Oh, I think its almost time...' she twittered, sitting up a little straighter and keeping her gaze glued to the tent that Alisa had just left. Within moments, Alice graced the crowd with her beautiful presence. Akira sighed softly as she almost melted back into her chair. 'She looks wonderful...' Akira whispered softly, there wasn't really any hint of jealousy or annoyance in the young girl's voice. The Shimada had never dreamed of perfect weddings, so attending one today, she wasn't sitting there simply envisioning her own. In all fairness, she considered herself too young to be seriously planning such a union, there were so many other milestones she'd have to cross first... So, the young girl could truly just streamline her emotions towards wishing well for the bride. Despite the nerves that the woman probably was dealing with, she held herself with impeccable poise, Akira didn't even notice the lack of a person escorting her... It looked like Alice belonged here, walking towards her man, that is all that mattered. It was strange, she and Alice definitely did not have the most stable relationship, but things that she had learned about the woman had finally fanned the embers of respect in Aki's heart. Not to mention, she'd always held Alisa in high regard and her close association to the solar mage had encouraged Akira to reconsider all the derogatory assumptions she'd made. It wasn't about the dress, it wasn't about the hairdo, all those just accentuated the expression of pure joy on the woman's face, one that Aki reflected in part, as she watched. Only when the orange-haired woman had closed the distance between herself and the groom, did Aki's eyes dart towards the man again. He too, seemed to be as glad as his bride was. Whatever it was that had kept them from this moment was so long, didn't matter anymore. However, it truly was a pity that they couldn't find a moment amidst all the chaos to celebrate their relationship earlier, the two deserved this occasion. Much like she had predicted, the cross he wore on his back now adorned the altar, standing tall behind the Father who was all prepped to join the blonde and the solar mage in this holy union. Everything felt so strange, as if it went too quick in one way and at the right pace at the other. Her feet softly touching the carpet that they made for the makeshift aisle that she was walking down, looking where she walked until her eyes found the person she was looking for and not letting go of his eyes. She couldn’t stop smiling as she looked at Konstantin. Today they were getting married, she was almost at the altar when it hit her and the nerves that she had felt minutes ago simply exploded by a sense that could be described as butterflies in her stomach; she didn’t mind at all. She heard a soft giggle and turned her eyes towards the left, it was a clear sound in the silence that had reached her and she looked at her children, their children and shortly at her companions who grinned at her as well as she did to them. Her senses seemed to be a bit dulled as she couldn’t think of anything else or realize much else than what was happening to her alone. She had seen the people when she started her walk, which had seemed so long and now she was there, stepping up the two steps to the altar, where she beamed happily at her fiancé and shortly turning her gaze to the priest, the one she asked from Magnolia, she gave him a short nod as he greeted her in the way that was appropriate. He said something shortly, loudly, for everyone including her and she was sure that she should listen and she half did but it didn’t reach her, fussing over if she would say it right, if she would speak clearly, although she did hear something about why everyone was gathered here today to united a man and a woman and something that was very normal to say, as she tried to be polite and look at Father Jerad, her eyes kept going to the man by her side. Much sooner than she anticipated, she had to turn, being able to look nowhere else as it wasn’t necessary. Where they would have to say their wedding vows, give each other a ring and become like Father Jerad said; united. and the Father continued to ask them one after the other, Konstantin first, she second a short list of what she would and what her answer would be. So when it was her turn, she turned to look at Father Jerad out of politeness. To which came the point of the rings and to be called husband and wife and of course, sealing it with a good kiss~. Not much later, still in a bit of a daze she was moved towards a different spot, there were wooden floorboards to make up for a dance floor, simple places to stand without the grass being a hindrance. She stood of course by Konstantin’s side clutching the flower bouquet perhaps a bit too harshly as people could now use the opportunity to congratulate them, get a drink, dance (as the music started again), or talk to others. She finally had eyes for others or well a few more, she looked for Alisa as well as for her children. But her mind finally relaxed a bit to recognize faces and to her already happy mind, she spotted Alexandr and many of her friends, she was so glad to see them on this day. It was time, It was truly time. He and Alice were to be wed. It was something he had hoped for ever since he had heard the news of her pregnancy, unfortunately they had not been married before she gave birth to Anton and Tanya, but that’s just how life went. In spite of his preference to have gotten married earlier it seemed that fate had favoured their choice of having the wedding later rather than earlier. The festival had proven a perfect way to encourage many of the invitees to attend with them being there already. All that really mattered in his opinion though was that Alice was there besides him ready to take on the world with him. Their bond would be solidified with the aided of Father Jared whom begun to say the holy words to join them in holy matrimony. They had asked for him to say minimal and requested that they would need to responded in kind, neither of them were particularly fond of being in the limelight specifically Kon still baring prominent scarring around his golden eye from Alice’s sister, Lacie who attacked him when he was in a weakened state. As was tradition, Alice was the first to respond to the questions prompted by the priest with Kon answered directly after them. With the duo having said the final words and with the priest revealing the couple as married Kon took up Alice embracing her entirely clutching her head with his right hand and lower back with his left before giving her a passionate kiss that lasted well over half a minute. Ceremony now complete festivities could now take place with their couple now being able to socialise with their guests as a duo. Many of the people who had been invited had been at the request of Alice and thus would require an introduction while others Kon had met but never learnt their names. This was a prime opportunity for him to gather information and perhaps even friends. The wedding seemed to be going well, with no issues yet to have made themselves known. The guests were enjoying themselves, and the ceremony went down without a hitch. The only person that had any reason not to be having fun was Odin himself amusingly. He was technically working at an event that he was also best man for, and on top of that he was constantly being bombarded with evil looks from people that thought he was a monster without even speaking to him. But honestly, he was having a blast, celebrating the union of his best friend and the woman he loved, even ignoring the complications Alice brought to Odin's life, of which there were many. Odin wasn't the only one to notice the looks he got, as Arisa brought it up, coldly mentioning it and clearly being on Odin's side for the entire ordeal. Placing a skeletal hand on his friend's shoulder, the deep, hollow voice spoke in a calm, warm tone, "Yeah, I've gotten used to it now. You should see it when I walk through town, it's like I just killed everyone's newborn child in front of their eyes." Despite a morbid image, Odin chuckled lightly, glad to have Arisa here with him, even if she would rather be with her lover, who had apparently not shown up. Odin had never met the man before, and was interested to see what he was like. After all, he was to Arisa what Alice was to Kon: the lover of one of the Lich's best friends. As the wedding progressed, Odin waited for his moment. Alice appeared, the priest began with the vows, and then it was time for the best man and maid of honour to produce the rings. Stepping up, and producing Kon's ring for Alice, he would pass it to his friend with a nod and a smile, for a moment forgetting that a smile would be present on his face whether he wanted it to be or not. He would then stand next to his friend, facing away from the altar out towards everyone gathered. 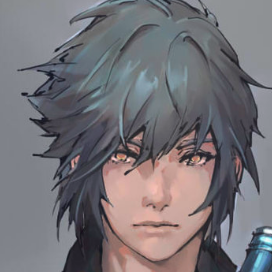 His face would not change no matter what he saw, but in particular he'd be watching for anyone that gave him a distasteful look, and making a mental note of everyone who did. Later, they'd get the opportunity to meet Odin personally, and how fun that would be for everyone. The wedding ceremony concluded, and everyone made their way to tables or to the dance floor, enjoying the event now that it had gotten into full swing. The bar was constantly being flooded with guests wishing for drinks. Odin almost felt bad for Lilja, but he knew that, before long, he'd also have to jump behind the bar and help with whatever he was needed for. Before that, there was just the simple issue of the best man's speech, the first speech to be given after the ceremony itself, where Odin would address all the guests, thank them from coming and then talk of the union between the two newlyweds. Standing from his seated position, Odin would raise a spoon and hit the now empty glass of red wine he had been sipping, prompting everyone to be quiet as he was about to speak. Once that was the case, Odin would move to stand in the middle of the room, allowing him to move and address everyone, as he began his speech. "Ladies and gentlemen, let me be the first to thank everyone for attending this monumental occasion. And before anyone asks, yes I am a Lich, an undead 'monster' if you will", Odin raise his hands in quotation marks to make his sarcasm evident to all, "but why should that matter at all. No one is here for me, you're only here to eat my food and drink my alcohol, which a lot of you seem to be enjoying. Swineherd Pub in Oak, check it out someday." Looking over at the groom, Odin shrugged, having been unable to help himself at promoting his establishment. He chuckled, and then his voice went calmer, and full of compassion for his best friend. "Today, we are here to celebrate those two over there. Konstantin and Alice Sokolov, one of the most amazing people I've ever met... and her husband who I met one day while fishing. Kon and I have known each other through some drastic changes, I was alive when we first met, and he still had a full face." A cheeky wink came from the Lich's face, aimed towards the groom as he continued, "Two people: one I've known for far too long and one I haven't known nearly long enough, it's been an absolute joy to get to know you both. I wish you an eternity of happiness, for both you and your families. Alice, you've made Kon the happiest man alive, and there is no doubt that the feeling is mutual." Turning back to the guests gathered, Odin would conclude his speech, "Ladies and gentlemen, I invite you all to drink my booze and make merry all night long. But before that, I ask you to stand with me in wishing the best for the new Mr. and Mrs. Sokolov." Raising his glass high in the air, Odin announced, with more pride than he had ever felt in his life, "To the happy couple!" Granted, that alone seemed a tall order in a glamorous gala such as this, with stunning sights drawing one's attention left and right. The idea of she herself getting married truly appalled Alisa, and yet she couldn't help enjoy her friend's weddings to the fullest, so much even a crowd this impressive failed to annoy her in the slightest. "This day is yours, Alice. Your love, your spotlight...", far too silent to make herself heard, the sculptress merely mused to herself, confident her thoughts would reach her friend if not her words themselves. She'd defenitely fret and worry, yet soon enough, all would fade into nothingness, seeping into a bottomless, radiant pool of joy, "Savor it to the fullest~"
Relief in the knowledge that only the groom's support would be expected to give speech. She couldn't help but chuckle, shaking her head and bringing her hand to her face as the self assumed Lich's choice of humour involved a wanton of his business... Quickly followed by a far more pondered, experimental sip of his sparkling wine. It did indeed live up to his advertisment, so she'd hardly call it misleading. But even with this hearty, good natured speech, many still struggled to keep their eyes on what really mattered. "To our lovebirds~! ", she echoed, raising her glass vehemently enough for the clear fluid to swish around, flashing both the couple and the best man her most radiant smile, "May they live happily ever after~"
After all, she wouldn't really judge a man for the amount of skin on his bones. Some guys can get genuinely distasteful when roasting the groom as a best man; so for a guy many here regarded as an embodiment of evil, he'd been rather gracious best man... With the people now free to mingle, Alisa immediately sought out some of those faces she'd see at the wedding hall. Alice and herself truly had more common friends than she'd ever have guessed, and that meant she had a lot of people to catch up to. Before long, Noel returned from the bathroom. Having cleaned his wolf coat properly, he'd try and look for seats. Noel spotted a familiar face, it was his girlfriend; of course Arisa was going to be here. He couldn't see her properly, but since she had quite the length it was obvious that it was her. After doing the tango, flamenco and all sorts of other manoeuvres to guide himself through the crowd he had finally found himself beside her. Making sure that nobody else was going to claim the seat, he sat down and let out this old man groan. Most people started to settle in, and the ceremony was about to begin. Noel was scanning the room, for any familiar faces - and also for faces he hadn't seen before. He wasn't quite certain which people were connected through which means, but judging by the seating arrangements he could tell which cliques had gathered. Before long an organ started to play, from what Noel could tell. The crowd started to get quiet, people quickly finding their seats. The shuffling of footsteps and hushed whispers as the bride and the groom made their way to the supposed altar. When the ceremony was concluded, Noel got up. He'd offer his arm to Arisa, offering her his company for the time being. He naturally avoided the dance floor, but the direction near it caught his attention when he heard a spoon hit a wine glass a few times, the signal that someone was about to hold a speech. This man was a lich - and the first thing he did was alert everyone of this fact? How peculiar, did he perhaps become a lich for the attention? He decided to ignore the broad context of this, and raise his wine glass in the good spirit of this wedding. Were Noels first spoken words in this wedding, he said those words with a raised voice, expecting others to give their blessings as well. He'd turn his attention to Arisa, expecting her to toast glasses with him. After taking a modest sip of his wine, he returned his attention to the rest of the wedding. His intention wasn't to stay here for a long time. It was quite crowded, and Noel wasn't a big fan of crowds. "How are you liking the wedding so far?" He'd ask Arisa. Maybe this was an opportunity to meet some of her friends. Though sadly he didn't know who her friends where, perhaps she could point them out - or introduce him to her friends. "Maybe you could introduce me to some of your friends? Which of them are weird?" Now, Daiko would’ve hated the situation where Coda wouldn’t stand still. Especially during the most important ceremony where the groom and bride had to share vows and all, but fortunately, the smart raptor knew her manners well. A well-trained yet extremely cocky and selfish bird turned so loyal and lovely in the presence of women, especially the ginger knight Alice. Even he, Coda’s own master, could not read the bird… like, at all. It was unexpected yet oddly useful at times. It was as if his field of view focused merely on the two marriage partners, causing everything else around them - from the other guests to the tent’s edges and chairs - to dissolve into nothingness. At that moment, he realized that Alice and Kon had gone through a checkpoint in life; once a lovey-dovey couple was now so much more sacred and beloved than ever. Was this the magic of wedding? Would he ever experience the same thing…? For a moment, he considered speaking with the skeleton guy; he seemed like such a humoristic person. Daiko was convinced that he could get a good laugh out of that creature, but his eyes spotted a more familiar face first. Alisa stood a few meters in front of him by that time, in which he decided to go and greet her. Coda was already eager to meet the sculptress and began stretching her beak out and all, but Daiko managed to get her under control until he approached her. Fia smirked at her lover's sly little comments about climbing and catching bouquets. It seemed Esperia took the activity very seriously, which was rather adorable. "Forreal though Princess, yer gonna need a boost if ya wanna catch those flowers." Fia teased lightly as they continued along. Liana had some questions about the bride, and the interesting woman was explained a bit by Esperia. She was a stubborn and dutiful person, apparently, though Fia wondered if fanatical belief played a role. Though Fia had only respect for the Holy Knights, with her lover's late sister having ranked among them, religion was still a bit uneasy with her. Titans and Gods didn't exactly have a tendency to get along. She could worry about that later, however, as once Lumen arrived they'd be seated for the ceremony. Esperia was snuggled up against Fia, who welcomed the embrace as she tried to focus on the proceedings. It was still hard to believe they'd be in the same positions sometime in the near future. Fiammetta took countless mental notes as the proceedings continued. Would their wedding be as traditional? Would Espy want a priest? What the hell was she gonna do for her vows? Writing wasn't exactly her strong point. If anything, Fia at least took solace in how happy the bride and groom seemed. It was a big event that required a lot of planning, but it seemed worthwhile in the end. The ceremonies concluded, and it seemed like the time for socializing and drinking and dancing had come. With how overwhelming things had become, Fia was mainly looking forward to the last one. For now, she just hung around her fiance, relying on her connections. First, the best man would deliver his speech. A fine speech, Fia decided, even if the plugging of his own establishment was a bit shameless. Once it was over, a toast was declared, Fia raising a wine glass she'd retrieved out of courtesy for the couple. "Cheers to the couple." Fia said quietly, before turning to Esperia with a questioning look. "Well Princess, yer the one with all the friends. Who do we wanna talk to?" She asked with a slight grin, somewhat curious as to what other acquaintances of her lover might be present. Fia still felt a bit out of place, so would let Esperia take the lead for now. Maybe she'd get a chance to pop off and speak to 'Giggles' and 'Scarface' later. From what he was able to hear it sounded like the wedding was going well even though he was face deep in his notebook jotting down every last emotion that past by him and page after page his notebook was filled with detailed lines somewhat descriptions of everyone he saw prior writing. he stopped and did a few quick scans of the place just to make sure everything matched up with his notes. Everyone looked super happy to meet each other while others seemed glad the food was still on the table but that's any kind of party for ya "Oh is that the groom? He kinda and looks like..."
The moment that he saw Alice's husband his jaw couldn't drop any faster than it did at that moment That's the same man that shot me! he didn't know what to do with all of this, should he confront him or just let it go? TK's started to feel some pins hit his chest the more that he thought about it when he remembered his calming methods. He opened his bag and rested his hand on the plushie as he had filled it with a soothing rock his grandmother gave him months ago I have to confront him head on, he thought to himself getting up and heading over to the bride and grooms table "Umm...aaa excuse me Mr. Konstain your a very lucky man!!" his brain and mouth had been on different paths once he was able to get the words out He's really scary I can't even say whats on my mind, a fact that was showed as he started to sweat just from being near him. With her attention devoted to the ceremony it was clear that Esperia was quite interested in the wedding, the way her eyes were alit with childish excitement and her hand gently squeezed Fia's own, there was no doubt that alongside her happiness for Alice to be able to experience such an event, she was no doubt also daydreaming about the day that it was she and Fia would stand at the altar. What would it be like? For a moment she couldn't help but wonder how her family would have reacted. Her sister clearly had approved of her relationship with Fia, in the end, she had always been an open-minded person, so it came to no surprise really... However, what about her parents? Her mother was gentle and caring and had an understanding mindset, so she would have likely said that as long as they loved each other, it would be fine. "Demon lords, liches, holy knights, this marriage is one for the records." Asmodeus hummed in amusement as the best man began his speech. "Umm, can a Lich actually taste his own food? He must be quite confident in his skills if he advertises the pub without testing his own meals. Then again, from experience, I can say that the drinks and food at the pub are quite nice. Almost good enough to die for." the obsidian-haired trickster snickered alongside her little jest at the end. Still, recalling Liana's confusion from Lumen's appearance earlier the girl mused softly. "It's something that happened a while back~ since back in Crocus if I recall right." However, as the ceremony reached its conclusion and Fia inquired about where they would go next the girl decided to chime in on the idea. "How about we do the opposite this time? Let's go and look if anyone you know is here~ Like we can talk to Alice and her husband Or..."
Her cheeks flushed up lightly as she whispered in a softer tone. "We could dance a bit once the music gets going~ I think it is better to do that before Fia gets a drink~"
Meeting some new people certainly sounded like a fun idea! While she did finally manage to get comfortable and did some kind of normal settled strain of thought for a moment. Mostly wondering what the situation of what was going on now? what part of the wedding where they on? After all her mind was more wondering and slightly worried about how she felt weird and slightly odd at a wedding. Even if she was finally settling down at this point it was slowly becoming a minor thought at this point of the wedding. Settling to manage to sit alone Judina felt a bit more normal now, while it seemed now the more important things to pay attention too now, It seemed to be the walking down of the bride. Judina wondered yet again if this was the normal of this to happen. As well that her mother never told her how a wedding works she just giggled happily and told her it was a joyous situation to be in. Nonetheless She smile at the situation now she was still at least happy to be here after she finally settled. She could easily see the happiness and joy they see in one another. Anything Judina personally really thought or worried about personally or mentally all finally faded away for the moment, after all it was a celebration for the both of them, She shouldn't just be worried about how to be and act alone she could do that later after all doubts and negative thoughts were always something that do return. It for once brought a smile to her face even if no one really was around, even if she was alone no one would really notice. The couple just embracing the moment was interesting. Along with thinking it is interesting she also found it kind of adoreable for once as well never realized for until now maybe why her mother took enjoyment with the thought of these...even if Judina was different then her mother. It seemed the moment where they continued the moment where they with one another and how it all seemed normal and joyous, It was that peaceful moment she kind of wanted to have. It seemed that the only thing she also gained her interest was the lich's speech it was a lot more casual then she would assume a how a lich would talk to a group of people, But Judina knew it would was wrong to assume, she did not know this person and he did seem interesting her in thought to talk too but even then after the wedding she had other thing to focus on after this. Judina did have another thought of finding the mention of a Pub, So he had something to gain from it as well it was quite funny if anything in her eyes but would not judge after all there was a small amount of charm and wit that works with these kind of speeches. But the moment so far was still normal and peaceful, it was still kind of relaxing everyone else but her still seemed to start either joining in the hail to the newly weds or talking with there groups. Judina did not mind she would just still stay where she was and keep to herself, until in the end something else would happen but did not expect anything for now she was more then happy and content to stay with this moment and wait until its done see what was next. Her head shook slowly as she heard Lucifer say that he's quite use to it. A small frown appeared on her beautiful lips as the corners of them slanted downward. Her golden eyes gazed away to look at all the people. She knew some that were here. Her perfect vision saw Esperia and the lady next to her looked familiar as well as she was at the fight against the enemy. Next, she looked over to see Alisa and the bride and groom as they were then speaking, but before that she saw particular person she was waiting for. Her golden mirror eyes reflected her man as her heart pounded. ''Noel, my love.~ You made it.'' she spoke quietly with a sweet -open mouth smile. With him sitting by her side she leaned her head against his shoulder as the wedding continued on. Hearing his groan made her chuckle softly and placed her hand on his left thigh, squeezing it a little. ''You're okay, you big baby.~'' she teased with whispers as it begun. After their vows and the kiss that finalized the bond of holy ones, she felt movements from Noel which made her sit up. With that they moved on as she grabbed the hand that was offered to her and got up herself. Straightening out her long white dress, she took back his hand. Once she was out of the shade her fair colored skin glistened from the sun with some lightened pink on her cheeks and shoulders from the heat. Arisa's blonde hair bounced up and down as she walked with him as it shined like a star. Before walking off, her head turned to Lucifer, ''I'll talk to you later.~'' she says in her usual soft tone and then walked with him. Whilst removing her hand from his, she instead moved her arm around his waist to grip onto his right side. She could feel how warm he was, but instead of his usual smell, she smelled soap that wasn't from what she used when she washes clothes. Her eyes cornered upward to look at him. ''Did you get it dirty?'' she questioned. She wasn't mad of course, but she wondered what he was doing before this. Arisa heard him ask about her friends and that's when she started to list. 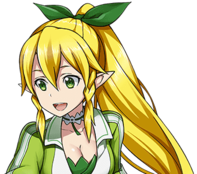 ''So there's Alice, Alisa, Esperia and -... yea.'' she started to list, but she felt like she was annoying him out of just 'feeling' like she was. 'Why is he suddenly interested in my friends?' she wondered coldly to herself. Her eyes looked forward and then towards the Alter she saw Esperia. ''Let's go towards the Alter.''. She wanted to give some casual 'nickname' such as; darling, dear or honey, but she felt like he wouldn't care much for it. Her right canine bit her lip nervously as she felt her heart beat hard and fast. Soon enough, they caught up with Esperia who was about a meter away. ''Esperia!~'' she spoke out and used her free hand to wave to her friend. Her eyes switched to look at her partner - who she was going to marry. All these people getting married, accepting a holy bond with them. Someday it'll be her time... When they were close enough to at most shake hands, she looked up at Noel and then at Esperia. ''Esperia~ This is my lover I spoke about. I am assuming that lovely lady is yours.'' Arisa spoke elegantly and softly, turning her head to look at the brown hair beau. Due to height differences though, she had to simply tilt her head downward to gaze. Sometimes she missed being shorter than what she was, but this was alright. “Nice," he mumbled to himself as the lucky couple kissed. 'I guess they're finally together.' he thought, smiled and leaned back towards the counter as the wedding ceremony came to an end. "Maybe I should go and congratulate them on their 'big day.' Time to talk to my brother for the first time in like, a year." he mumbled and looked around. "Guess the 'party' is getting started." unexpectedly, the 'skull' took the stage which meant that he was the best man. Maybe he would finally found out who he was and what he was doing at this wedding. It was a fine speech, and it cleared up Aleksandr's doubts what he was, however, he still had no idea what a ‘Lich’ was, but at least he knows what to call the creature now. He still didn't know his name though. As the speech came to an end, the Lich invited them to raise glasses in honour and wishes for the couple, and Aleksandr more than happily did so. Some kid beat him to wishing them a happy married life, but he didn't mind. He walked over to where Alice and Konstantin stood and said "Congratulations." and then continued with the obligatory "You're a very lucky man." he said and smiled and then stood there for a moment, maybe deciding whether to hug his brother or not. He wanted to ask Konstantin how he was but he didn't know if it would be appropriate. Maybe he should just refrain from it and talk to him about well, everything. "Have a happy married life." he softly said and smiled. He did think it was just a little corny, but he didn’t know of anything else to say anyway. While he didn’t even know if they were on good terms, he felt that he should at least hug his brother on his big day as not doing so might be considered rude. He’d rather much take his chances with hugging Konstantin than with visibly restraining from hugging him and possibly offending him. He didn’t want to ruin their wedding day by even a little bit. He went in for the hug finally after giving it some thought. He then went back to the bar to finally get a drink for himself. Just like most of the gathered guests, Haru’s eyes were glued to the two stars of the occasion as they stood in front of the priest, reciting their vows. It was when the two exchanged rings that the healer’s cheeks went an even brighter red. The act reminded him of the day when he gave Akira one of the two rings that the vampire had gifted him. He had no idea that rings were part of the marriage ceremony; he wondered if she knew. Haru toyed with the ring he wore and turned to look at his raven-haired partner who sat next to him. The healer’s attention was quickly averted back towards the altar, as the ceremony ended, and the lich raised a toast for the newlyweds. The redheaded Knight raised the glass of fruit juice he had picked up before and joined in. “To their long and happy life together,” he said, and took a sip. Haru would have loved to walk up to the couple and congratulate them. However, he knew Akira wasn’t fond of crowds, and he neither wanted to force her to swim through the crowd nor go without her. So, he decided to wait until later to approach them. For now, it was time to enjoy the food and greet the ones he knew personally. At least, that was the plan… until the music began. Hearing the merry tunes, Haru broke into a wide smile and stood up with childlike enthusiasm. 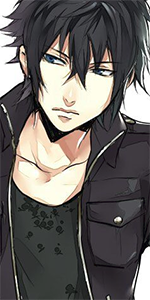 Turning towards Akira, he held his hand out and blurted out. “Would you like to dance?” he asked, rather confidently. In a moment, even he wasn’t sure where he got the courage from. Maybe it was the love-stricken atmosphere; whatever it was, he was grateful to it. He didn’t expect her to agree immediately; after all, the dance floor would be crowded too. So, he was already planning on what to say to convince her. Despite being underage, out of a spark of rebellion, Aki had picked out a flute of an alcoholic beverage and pretty much downed it while Tsuru wasn't looking. The only evidence that remained was the soft and gentle shade of pink on her cheeks. Safe to say, weddings created an atmosphere that could cause that. She picked up a glass of juice, like her partner, to cover her tracks. While she'd found everything wonderful and she truly was happy for the couple, Aki was never too fond of elaborate ceremonies. She'd started to tap her feet while the vows were read, betraying impatience. Hopefully no one noticed, considering most had their gaze plastered onto the couple. Akira did believe that love should be celebrated, but making it almost contractual, was where she thought the problems began... Why couldn't people just love and not find the need to profess it in such a stark manner? It wasn't like the lunar mage was judging, she just found the theatrics around it a little unnecessary. Perhaps it was just a reaction from the alcohol... Maybe it was making her a bit jumpy and hyperactive. The teen steered her mind towards the aspects of the gathering that she did like once again, to avoid falling into her usual pit of pessimism. She widened her eyes and just for a second and stole a glance at the healer as the ceremony culminated with the exchange of rings... Quite recently, he'd collected a pair of matching rings from one of their excursions and offered one of them to her. While she had not assumed any significance since he didn't have any memories to associate the act with marriage, she was curios about his reaction. Not to mention, frankly, it was a bit embarrassing to watch Alice and Kon's lips-locked for centuries anyways. But catching the redness on Tsuru's face was no less blush inducing, causing the pink on her face to deepen to a red. Just as Akira was about to tear her gaze away, their eyes met and locked, causing her to pause. It was just that, a shared look, for a brief moment before she spontaneously cleared her throat and the two were turned towards the altar again, just as the couple pulled themselves apart. 'Indeed. To togetherness and happiness.' she added, raising her own glass and following suit, but gulping instead of sipping, out of this strange nervousness and the warm fuzzy feeling in her heart that she was trying to quench. Akira looked around, noticing the way the people gathered to greet each other. There were a few people she'd be happy running into, but she couldn't find it in her to wade through people and approach them herself. His question caught her so off-guard that she responded without even thinking. 'Yes.' Then she frowned, unsure of where this spirit of agreement came from. Clearly, in the depths of her mind, she wanted this, the alcohol probably moved things along. It was just that she was experiencing feelings she'd never quite thought to acknowledge or deal with before. 'Er... I mean...' It would be churlish to refuse now. Besides, people were still making merry, the dance floor wasn't too packed... 'Sure, let's go.' Aki took his hand and pulled herself off the chair. ”Oh, shush,” the woman lightly punched her lover’s chest, a flush of pink bloomed on her cheeks. ”Don’t say such things here.” Though admittedly, her beau’s comment was rather inappropriate for the event, but she wasn’t going to lie that it didn’t make her smile—to know that she was the only girl he had his eyes on, amongst tens of them in this room. The snowy maiden grabbed a glass of champagne as a waiter passed by them, slowly swirling the liquid inside the fragile glass while she observed her surroundings. People were beginning to gather and she’d spot a few more familiar faces over the venue. ”Apparently so,” she agreed, with a responsive nod. She might have not been able to greet her comrades right away, albeit, she promised herself to attend to her fellow guildmates sooner or later. In a short while, the music stopped. It was finally time for the bride to make an entrance. All eyes were fixated onto the door of the tent, including the couple themselves. Excited and somewhat nervous for her acquaintance, she felt her breath catch her throat as she waited for the bride to step inside the hall. The happiness that was shown upon Alice’s smile was contagious and the joy that she felt was spread through the entire venue. Snowflake would clutch her hands together, pressed against her chest—it was a breathtaking moment to witness for her. Seeing the event unfold, a part of her wishes to experience the situation, yet, another part of her didn’t want to let go of the freedom she had currently. Perhaps it might already be time for her to settle down since she wasn’t getting any younger as well, and the couple had been dating for far too long; long enough to even know what they would be eating for breakfast the next day. She wondered what the future had in for her, but only time would tell for her turn to arrive. Everything and everyone was silent when the bride and the groom exchanged vows, as they promised themselves to one another. A sigh escaped her lips; not out of exhaustion, but of content, relief and happiness for her friend. Even from a guest’s point of view, she was already elated enough for the married couple; imagine being in Alice’s shoes herself—she’d already be on cloud nine. Once the most important part of the event was over, guests would return to their seats and the chatter would begin. ”That was beautiful, isn’t it?” she shifted her attention to meet her lover’s gaze, a warmth in the depths of her chest that quickly spread to the rest of her body, making her feel like she was lying in a field of beautiful flowers, showered by the sun’s rays like the warmest of rains. Soon entered a lich; one whose presence that most likely no one would expect, as he began the speech directed to the newlywed. ”Hm, unusual,”—was all that left her lips upon seeing his debut before she sipped onto her glass of champagne and tasted the rich liquor. Her eyebrows raised unexpectantly when the lich promoted his own establishment, though she’d have to give him props for his sense of humour. ”To the newly wed,” she lifted her glass into the air and quickly chugged the liquid down her throat as a form of celebration. As she just realized the people that were here, not only her now husband, which sounded still so weird new in her mind, for obvious reasons, as well as more people than only the maid of honour. She grinned still, the speech of Lucifer and the happy toast from Alisa, she looked at her friend and mouthed a thank you without making the sound. If it wasn't for Alisa, she was probably still freaking out in the tent where she had changed into her wedding gown. At least she was looking less pale at this point and the nerves were mostly gone. With one glass of champagne in one hand, just brought by one of the waiters, she still held the flowers in her other hand, she felt a bit clumsy but that would soon be over, she took a sip as the toast was too her and her throat felt very dry even if she had only said the bare minimum of words, they had meant the most. She looked at Konstantin, shortly as she had been doing that almost the entire time and it was pushing herself to focus her attention to anyone else. Hecate was the first to reach her, handing over her daughter while taking the glass and the flowers in exchange. Holding Tanya on her left hip, making sure her dress wouldn't get destroyed in the meantime. Jupiter stood behind her with Ceres now and her son, giving the option for Konstantin to take Anton or just take care of the boy himself. As the speech was done, she turned to look at one of her protégé, she frowned a little, always worried about T.K. now that the last time she had seen him, he seemed seriously injured, and he seemed nervous. But she smiled happily again as soon as she heard what he said and looked again at Konstantin. However soon her eyes turned to someone else and she was happy to see him, Aleksandr, she had bumped into him very lucky at that, in Crocus to invite him to their wedding, she wasn't sure if the brothers had met after their meeting, she doubt it else Kon would have told her so. Her golden eyes switched from one person to the next as he congratulated them and again called Kon a very lucky man. "Well I'm lucky too." She said softly, but loud enough before turning to her daughter who seemed to be pulling her hair a little for attention. She was lucky indeed for being there at the right time at the right point in Era, where they met. So many things seemed to be happening that she couldn't keep her eyes on one point. Too much to see, people to talk to and of course their first dance and husband and wife. Before Hecate took her daughter again, so she had her hands empty. She left the bouquet on the table next to her seat and simply forgot about it for the rest of the day. Nothing happened to ruin her day, which was a very happy thing, no estranged siblings that showed up, no demon fathers and other things that could have ruined a perfect day. It all went amazing, and it was even over before she knew it. There were a lot of people to thank for showing up and she would be the last one to leave or well the last one with her family, her now husband, the children and her companions. She had waved everyone goodbye, either with a short conversation or from the distance or they would have just left, she looked around, tomorrow nothing would be visible from this day but she would always treasure it and never forget. Exit, this topic is finished. Everyone can consider this as an exit for themselves.